Loch Etchachan in Cairngorms is situated within the central plateau deep in Grampian mountains. Being 927 meters above sea level, it is the highest body of water of its size in Britain. The loch is totally ice free only for short periods of time during a year. It is classified as oligotrophic (meaning nutrient-poor) and is devoid of fish. This remote place best represent Arctic-alpine character of these mountains, unique in British Isles. Cairngorms (Am Monadh Ruadh) are a mountain range that is part of Grampian mountains in the Scottish Highlands. The Cairngorm plateau is the largest area of high ground in Great Britain and as such is prone to heavy snowfall not only in winter. In May 2015 I spent 10 days roaming alone in Cairngorms walking through Lairig Ghru, Glen Derry, Strath Nethy and Glenmore. In the beginning of this trip I had a goal in mind – climbing the summit of Ben Macdui (1309 m), the second highest peak in Britain which was on my route. However, it turned out differently than planned due to particularly bad weather. The freezing conditions, constant rain or snow and especially persistent high winds made me abandon this idea for safety reasons. I remember at the time how much I appreciated staying night in a bothy (Hutchinson Memorial Hut) in Coire Etchachan as a gale raged outside. Since that time I wanted to come back to these remote, inhospitable but uniquely beautiful mountains again. This came finally to fruition during Christmas trip to Scotland when I joined friends and experienced mountaineers Fedor & Andrea who climb in Himalayas and other mountain ranges in Alpine style. Initially we did not set off for Cairngorms but rather for Isle of Skye on the west coast. However, during the journey to Scotland more favorable weather forecast was pointing towards Cairngorms. The providence at play, perhaps. We timed ascent of Ben Macdui just after Christmas (2017) because the detailed mountain weather forecast indicated clear views from the summits. Needless to say the weather didn’t turn out according to forecast models shown on dedicated information services. We left from Linn of Dee via Derry Lodge. The board at the lodge displayed information that the small bridge over Derry burn down the glen wasn’t quite in order therefore we took the path on the left bank. It was slightly drizzling and the weather did not suggest winter conditions ahead. Most of the snow thawed and there was very little of it lying up on the hills. We reached the bothy Hutchinson Memorial Hut built in 1954 in memory of Arthur Hutchinson (1902-1949), an Aberdeen born geologist. This was supposed to be our base for few days. Here we were greeted by 55 year old bearded man called Hugh. He has been a MBA (Mountain Bothies Association) member for a long time and as he revealed later on he was the first person who slept here after a substantial update in the form of extension in 2014. Hugh was warm and knowledgeable Scot who came here to prepare and test the routes on which he would be guiding group of tourists in March. As a person with considerable experience in these mountains he had had practical enrichments stashed around places for use when he would be in these parts. As darkness fell and the cold became colder we learned what these things were: wood, coal and whisky. All of them fuel and mood enhancers, if used in convenient way. The fire in stove transformed the atmosphere in bothy. It was Christmas and our evenings were filled by telling stories, eating food and sipping single malt whisky. Good fire in a stove is, according to author of The Scottish Bothy Bible, Geoff Allan, known as “bothy TV”. Starring into the fire can be mesmerizing and could even prove to be fatal. This we learned when carbon monoxide detector mounted on the inside wall went off. Science works. Thank goodness. In the night the snow fell and put a white blanket over the landscape. During the day the wind was very strong and we made a walk only to Loch Etchachan, the highest body of water of its size in Britain. Our food was going down so we decided to go for Ben Macdui the next day, regardless of weather conditions. Hugh was also going with us and we set off from bothy during blizzard. Snow crystals stung our faces all the way up to Loch Etchachan. After changing direction the wind was blowing from the side. Hugh was leading our party most of the way up but Fedor was also checking the route using his skills and devices. The snow cover was thin with grasses and stones peaking out however, the drifts piled up at places. 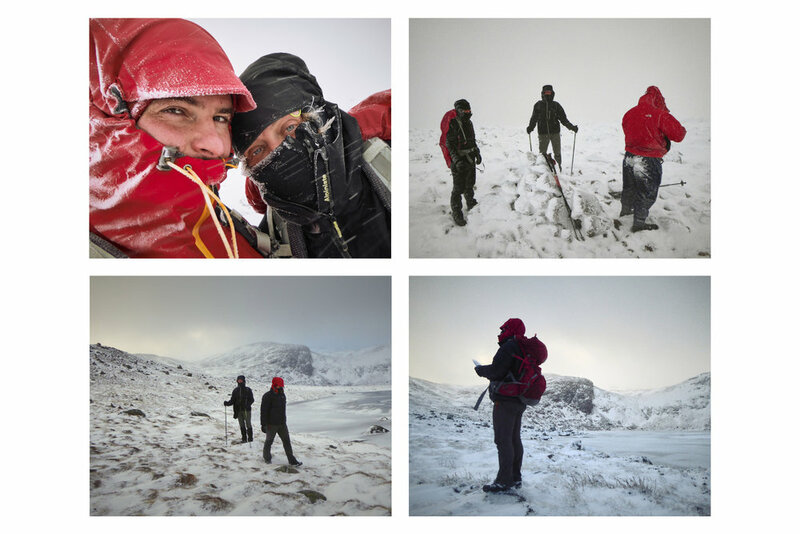 The visibility was very poor and we benefited from Hugh’s knowledge of the path in dreary terrain. The cairn we reached signified the Ben Macdui plateau. We were not far off the summit but stopped here unlike the wind that continued blowing relentlessly. Fedor made visible arrow in the snow in order not to get confused what direction we came from. This wasn’t summit proper and Hugh decided to walk another 150 meters to get there. We stayed put, looking at his large body disappearing into whiteness of the snow storm. The way down was actually much harder, at least for me. Going against the wind and face the stinging snow crystals was painful. Our previous footprints all but disappeared with the falling snow. This was a harsh environment. My cheek started to freeze and my fingers too. The wind chill factor made temperature even lower. The maximum wind speed recorded by automatic weather station built by Physics department of Herriot-Watt University on the summit of Cairn Gorm (1245 m) is stated in the book by Patrick Baker - The Cairngorms: a secret history to have been 176 miles per hour (283 km per hour). Comparing our struggle to such mayhem would be unimaginable. Still, it was difficult to breathe, hard to keep my eyes open. Hugh then caught up with us and we got safely back to bothy. 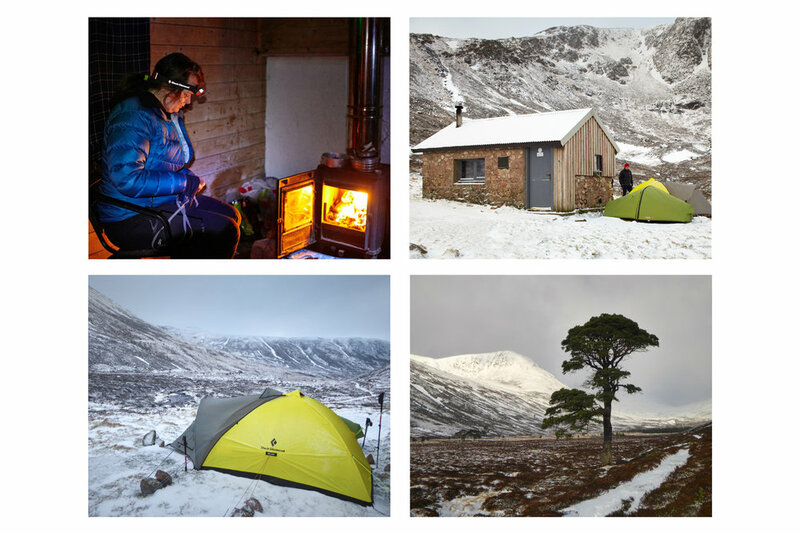 Although we did not get up to summit proper it was great journey to experience winter in Cairngorms and that in spite of cold conditions, strong winds and noisy rattling tents at nights. And as the old saying goes, the journey itself is more important than the destination. It certainly proved to be the case.